Art Deco style “Schwarzer Peter” card game published by Vereinigte Altenburger und Stralsunder Spielkarten-Fabriken A.G., Stuttgart. The pack contans 12 matching pairs of cards including elves, pixies, clowns, etc., plus one “Schwarze Peter”. 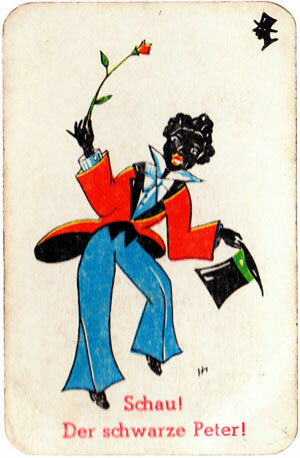 The main focus of the game is towards the last card which in this case is a comic black character holding a rose... maybe he knows if you've been good or bad! “Schwarzer Peter” was re-titled in other countries as Old Maid in England, Zwarte Piet (Netherlands), Svarte Petter (Sweden) and Pekka-Peli (Finland). 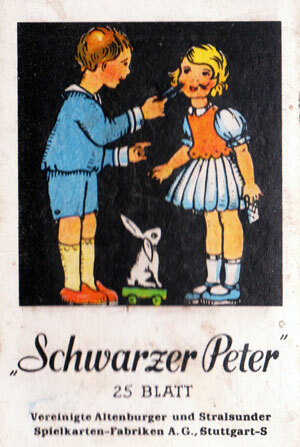 Above: “Schwarzer Peter” card game published by Vereinigte Altenburger und Stralsunder Spielkarten-Fabriken A.G., Stuttgart. 25 cards. Images courtesy Rex Pitts.